A great new release, by the creators of some of the best online slots games on the internet – RTG, is the newly released slots game called Triple 7 Slots. 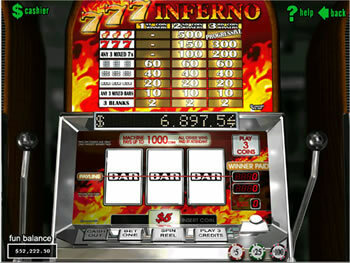 It is a classic slots game with three reels and only one payline. With 8 winning combinations and only 3 symbols, you have pretty good chances of winning. The first thing that catches your eye when you begin to play the game is the design itself. It is of a classic three reels machine, but with professional art and the very nice decoration, the machine is really coming alive on the computer screen. Moreover the sound effects and the music in the background make you feel like you are in a real casino. The big jackpot is a good amount of 1000 coins and the second jackpot is of 500 coins. The coin sizes are varying from $0.05 to $5.00, which is a very good range, and the max coin amount you can bet is of 3 coins, which makes the highest amount you can bet of $15.00. There aren’t any wild or scatter symbols in the game, nor bonus or gamble games, nor even an autoplay mode.